Coolidge Park fills with festival-goers during the Moon River Music Festival Sunday, September 9, 2018 in Chattanooga, Tennessee. The festival was sold out. 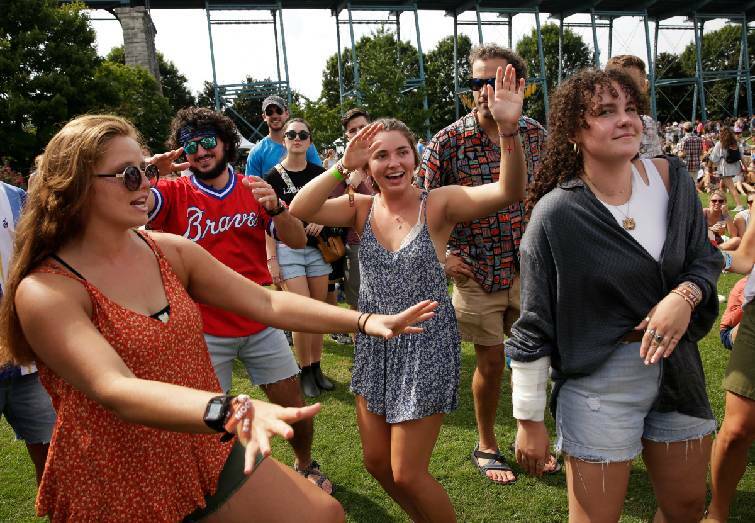 Fans dance as Liz Vice performs on the first day of the Moon River music festival at Coolidge Park on Saturday, Sept. 8, 2018, in Chattanooga, Tenn. The Head and the Heart headlined Saturday night's festival, which continues Sunday. The Moon River Festival is returning to Coolidge Park for a second year and this year's lineup will be announced at 10 a.m. today. The full schedule for the Sept. 7-8 event will be posted at timesfreepress.com and festival co-founder Drew Holcomb and Jonathan Susman, with the city of Chattanooga, will have a live discussion at facebook.com/timesfreepress, as well. Previous festival-goers will have the chance to purchase specially priced tickets on Tuesday from 10 a.m. until midnight, while supplies last. Tickets for the public go on sale Wednesday at 10 a.m. and will be available at moonriverfestival.com. All of the 10,000 available tickets for last year's festival were sold within eight hours of going on sale, with 61 percent of buyers coming from outside of the Chattanooga area, said Jeff Cuellar, AC Entertainment vice president of strategic partnerships. Susman called last year's festival "a phenomenal success for a first-year event" on many levels. For starters, it was nominated for a Pollstar Award for best music festival under 30,000 capacity. "There were really no big issues from the city's standpoint," he said. "We missed some timings on some street closings, and we will fix those." The festival was co-created in 2014 by musician Holcomb and Paul Steele, manager of Drew Holcomb and the Neighbors. When it outgrew the Levitt Theatre in Memphis, Holcomb handed over operation of the event to AC Entertainment in Knoxville so that it could grow even bigger, he said. "Honestly, as the months roll on," he said last month before a show he and his wife Ellie Holcomb performed at the Walker Theatre, "I look back and continue to be more nostalgic and wowed. It was so well-received I really have to pinch myself. Dreaming it up and letting it go to these new heights is very fun and I'm very proud of it." Susman said he will be working with all of the city departments involved, including transportation, parks and recreation and utilities, as well as with AC and merchants and residents of the North Shore to improve any issues such as traffic for customers and people who live in the area. "The plans are not formalized yet," he said. One of the issues is to how best to use the Walnut Street Bridge. As a public thoroughfare, it can't be closed to walking traffic. Last year, hundreds of people gathered there to watch from above, something Susman said greatly added to the "vibe" of the event. "We want to utilize it," he said. "It's a great way to enter into the festival. We want to do what is best for the festival and community and make sure it is safe, really. It's a great resource to have during the event. Everyone agrees with that." The announcement comes almost two weeks after Friends of the Festival, producers of the city's largest festival, Riverbend, announced it would shrink from nine days to four and move from early June to late May. 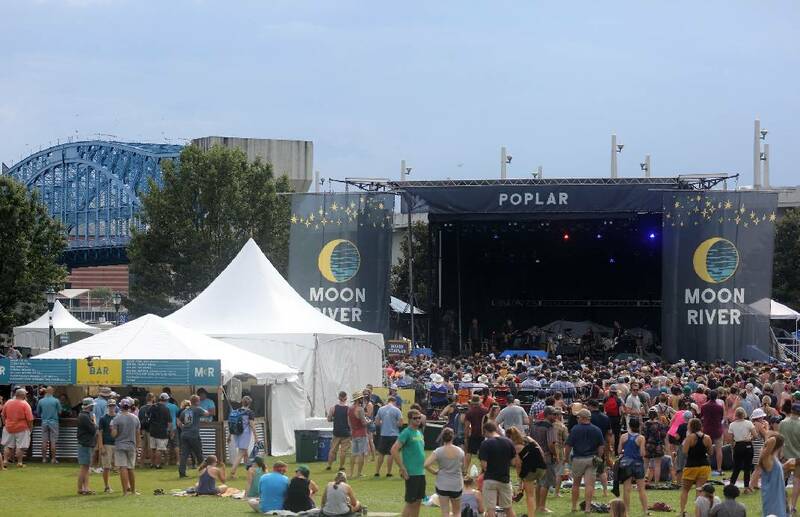 Mary Howard Ade, music marketing director with the Chattanooga Convention and Visitors Bureau, said the two events bookend a busy summer of music for tourists. "Riverbend is a longstanding event that is being revamped that now starts the summer and Moon River is a new festival that already feels like part of Chattanooga," she said. "Combined with Nightfall and Riverfront Nights, and 3 Sisters Bluegrass Festival — I could go on and on — it gives the city so much more to offer tourists to our city." Holcomb again will host a "Songwriters In-The-Round" event with Heather Morgan and Marcus Hummon on Sept. 6 at the Walker Theatre. Tickets will be available exclusively to Moon River festival-goers as an add-on. A limited number of VIP tickets also will be available and will include priority entrance, VIP bar access and viewing areas, an air-conditioned lounge and restroom, a commemorative gift package, and entry into Friday's "Songwriters-In-The-Round" event. Also returning in 2019 are fan experiences including The Lookout Lodge, an onsite sports bar designed for fans who want to watch NFL or college football games; REI Outdoor Experience, which includes outdoor activities including rock climbing under the Walnut Street Bridge, guided kayaking, and stand-up paddleboarding on the Tennessee River; and Tennessee Tavern, a curated cocktail and craft beer hub in partnership with local Tennessee breweries and distilleries.